Designing Fabric Interactions (DeFInt) is an ongoing project and also the subject of my masters thesis in New Media at Media Lab Helsinki. DeFint is an exploration of fabric as an interface medium for electronics. The focus is to specifically use the familiar “language” of fabrics to create novel experiences and interactions in our everyday scenarios. Design has not only been inspired by needs and purposes but also by experimenting with new materials and technologies. Recently, the development of conductive fabric materials has made possible to develop various kinds of interactive garments and furniture. Fabrics are an integral part of our everyday lives and have their roots deep in our culture and history.However it becomes quite unfamiliar when we try to juxtapose fabric with electronics. Both fabrics and electronics as materials have very definitive characteristics behaviourally, and also come with specific tools and context. Sewing machines, needles, knitting machines, soldering irons, pliers etc. have specific functions in their traditional environments. Electronics require tight connections, good contact, insulation for a reliable circuit. Fabrics inherently possess qualities that are light, fluid, easily influenced by the shape and nature of objects around them. 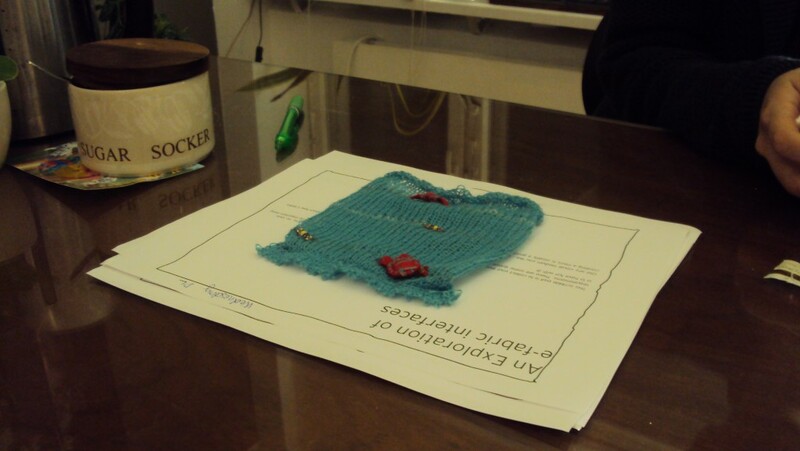 Bringing together fabric and electronics to create interfaces that are approachable is thus an interesting challenge. The project takes a hands-on approach, constantly sketching ideas and prototyping to test them. Fabric being the main focus, the project specifically draws inspiration from the inherent fabric qualities and actions associated with fabrics as well as reinterprets the traditional techniques and construction tools. The thesis aims to zoom into the idea of interactions and study the fabric medium through the design of individual “triggers” or switches that use fabric qualities to operate. To read more about the project and to follow ongoing work please visit the Defint process blog at http://defint.wordpress.com/. This entry was posted in Interactive Electronics, Thesis and tagged electronics, Ramyah Gowrishankar, textile. Bookmark the permalink.